Marvel Comics once published a series called "What If...?" Its highly doubtful one such title that came to mind for this series was... "What if Stan Lee sued Marvel?" Yes, Stan Lee and Marvel Comics, the company he's worked with since the 1940's, have come to a cross in the road. (Where's Matt Murdock when you need him?) Unfortunately, the universe which Lee co-created is but a myth. The reality is, there are no superheroes. There is only profit-less films, corporate litigation and heartache. Lee's attorneys have filed papers in Manhattan federal court stating Marvel signed a deal to give their client 10% of any profits from his characters used in films and television shows. Lee states he has not received a sole penny from Marvel, despite "Spider-Man" being this year's biggest hit - grossing $403 million domestically. According to the suit, Marvel is refusing to honor its commitment now that "Spider-Man" has achieved blockbuster status and expects similar successes with other films, including the upcoming Daredevil movie starring Ben Affleck. Lee is also seeking a share of profits made from toys and other merchandise based on his characters. Marvel said that it doesn't comment on pending litigation but noted Lee continues to be "well-compensated" for his contributions to the company and the comic-book industry. (Lee receives an annual salary of $1 million from Marvel). 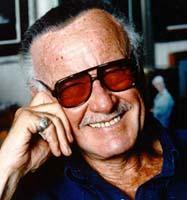 Lee, who has spent more than 60 years with Marvel and serves as the company's Chairman Emeritus, is credited as co-creator for many of Marvel's creations including Spider-Man, Iron Man, The Fantastic Four and the X-Men. Its fairly obvious who *owns* Spider-Man but who created the amazing webspinner is a whole other story. A tale crawling with entangled accusations, failing memories, and a "web" of mis-reported rumors. While the character first appeared in a comic tale created by Stan Lee and Jack Kirby (Amazing Fantasy #15) in 1963, the idea of the webhead supposedly bounced around the "Hall of Ideas" for nearly a decade. Was it Lee? Jack Kirby? Steve Ditko? Combination of two or all three? One such tale of Spider-man's origin dates back to the early 50's when Joe Simon submitted a proposal to Harvey Comics for a character with spider-like powers. He called the character, "Spiderman" but then changed it to the "Silver Spider" and then later to "The Fly." When Simon left Marvel to work for Harvey he gave the character sketches to Jack Kirby -- whom he co-created Captain America with for Marvel back in the early forties. During the early 60's, Marvel head Martin Goodman asked Lee for some new ideas who in turn went to Kirby. He produced two "new" concepts to Lee: The Fantastic Four (a variation on his earlier "Challengers of the Unknown" series) and the Silver Spider. 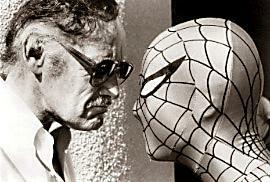 Lee handed over the spider sketches to another artist, Steve Ditko, who recognized them as works by Simon. Eventually, the character was dubbed "Spider-Man" and after his initial appearance/origin by Lee/Ditko/Kirby, the wall crawler would go on with his own series (by Lee & Ditko for 38 issues) before John Romita would take over as artist. The fact is, comic books (like film) are a collaborative process. Certainly there are exceptions to the rule (for both entertainers) but to give sole credit for any creation is somewhat unfair. For example, the highly debated credit: "a film by [insert director's name]." A film isn't the product of one man (the director) but also the writer, producer, editor, talent, etc. circa 1960's With most comics, there's a writer, penciller, editor and even a publisher who each might provide valuable input. As for a character, like Spider-Man, and the creative team behind such? The diplomatic approach would be to agree a character is not just created through concept, origin or initial visuals. We must also acknowledge the progressive characterization constructed through the development of various plotlines over the years until the iconography of the character is fully established. And if such is the case, Marvel would owe more than just Lee. Unfortunately, Lee made the mistake in agreeing to 10% of the "profits." "Net profits" are for "net-compoops," a famous actor once said. Creative accounting has allowed Hollywood to rarely ever show a profit on paper for any production. Getting paid on the "back end" (box office revenue after production expenses) is appropriately named because that’s usually where you take it. *A future article on this website will further examine the Spider-origin and Marvel's past dilemmas with creative rights - in particular, the unfortunate struggle of Jack Kirby and his attempt to reclaim 8000+ pages of artwork from his past employer. Stay tuned, true believer.